Proving that she is as fake a FLOTUS as her husband is fake POTUS, Melania goes gardening. Note the clean shoes, the unsoiled gloves, the way she waves magic at the shiny new basket, and the $1400.00 gardening shirt. Trump's garden is as empty as her head full of air. 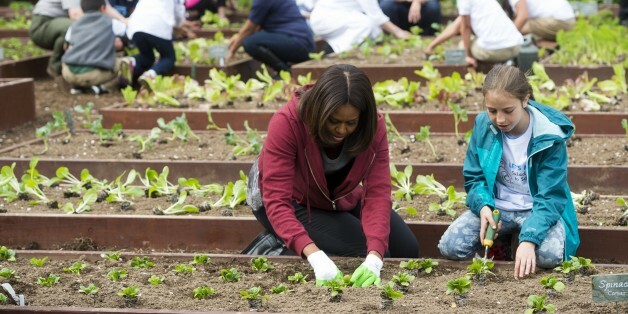 Former FLOTUS shows how gardening is done. Your post is devoid of content as Kim Kardasian's ability to expound upon quantum hyperparallel algorithms for matrix multiplication David. Andrei ... like your hyperbole. Not sure what David would do if Trump wasn't. David forgets the former FLOTUS employed thirty six tax payer funded gardeners. Got a citation for that Adolf? On second thoughts, don't bother, it would only be on dunny paper. No rational person believes that the FLOTUS is the sole maintainer of the whitehouse garden; that work is undertaken by the Parks Service, and still is to this day. Where have you been David? Next you'll be wanting a 'citation' as you call it when someone says the sun rose in the east this morning. Melania Trump has five staffers while your useless hero had forty five. What do you think she did with 45 staff? Some of them had nothing to do but gardening. No citation because, as usual, you are FOS. The claim about Mrs. Obama having the biggest staff in history may be due to the greater transparency of the Obama Administration in delineating the names, titles and salaries of those who have or are working for her. While this has always been a matter of public information, the Obama Administration is the first to publicly disclose it. Of course, one thing Michelle Obama didn't have was a lying grub of a husband who sells tours of Air Force One at $200k a pop. But I suppose you're OK with that, free Enterprise and profiting from public office and all. When you don't have an answer snipe and insult. Andrei and Adolf's post's add nothing and are not relevant.